PORTSMOUTH, Va. — The Coast Guard suspended the search Sunday for a pilot who lost consciousness and crashed an airplane into the Atlantic Ocean off the Virginia coast. On Saturday, the plane drifted into restricted airspace over the nation's capital, scrambling fighter jets that stayed with the small aircraft until it ran out of fuel, the Coast Guard said. Coast Guard Petty Officer Nate Littlejohn said the search was halted Sunday morning after a civilian boater recovered a wheel and engine cowling from the single-engine Cirrus. Littlejohn said the chances of finding anything else were slim. Crews searched the waters for the plane, which crashed about 50 miles southeast of Chincoteague Island along the Virginia coast, Littlejohn said Saturday. The plane took off from Waukesha, Wis., and was headed to Manassas, Va., which is about 30 miles southwest of Washington, National Transportation Safety Board spokesman Peter Knudson said. The plane, which had only a pilot on board, did not land at Manassas Regional Airport as scheduled. Instead, it stayed at an altitude of 13,000 feet and continued into restricted airspace near Washington, D.C., WVEC.com reported. Federal Aviation Administration air traffic controllers tracked the plane through the restricted airspace early Saturday afternoon. The pilot had not been responding to radio calls since 1:00 p.m.The Coast Guard was notified about 2:40 p.m. Saturday. Two F-16 fighter jets under the direction of North American Aerospace Defense Command (NORAD) came alongside the Cirrus SR20 to investigate and found the pilot unconscious in the cockpit. The F-16 airmen escorted the Cessna on its course over the Eastern Shore of Virginia until it eventually ran out of fuel and crashed into the Atlantic Ocean. The Coast Guard launched an MH-60 Jayhawk helicopter crew and an HC-130 Hercules airplane crew from Air Station Elizabeth City, N.C., and the crew of Cutter Beluga, based in Virginia Beach, to respond. The plane was registered to Ronald Hutchinson, of Brookfield, Wis. Relatives reached at a phone listing for him didn't want to comment Saturday night, according to AP. Rep. Mike Rogers (R-Mich.) on Sunday disagreed with the Obama administration’s refusal to call Russia’s military action in Ukraine an invasion. “I don’t think they’re there on a sightseeing tour,” Rogers, speaking on "Fox News Sunday," said of Russia’s incursions into Ukraine. “It’s hard to argue that Russian troops with Russian armor crossing the border into Ukraine doesn’t fit the definition of an invasion,” he said. Rogers’s comments match those of Sen. Robert Menendez (D-N.J.), who said on CNN’s “State of the Union” Sunday that Russia is clearly carrying out an invasion. Rogers, chairman of the House Intelligence Committee, argued that Russian President Vladimir Putin has stepped up his game militarily in Ukraine to assist Russia-backed rebels in the country, who Rogers believes needed help to hold ground. The Michigan Republican also criticized the Obama administration for not flatly calling Russia’s actions an invasion. “If the world perceives that the United States does not have a consistent foreign policy of saying what it means and meaning what it says, you’re going to see more of this pressure,” he said. Rogers told host Chris Wallace that the fighting in Ukraine shows that the administration’s unwritten “don’t do stupid stuff” foreign policy mantra isn’t working. The Department of State warns U.S. citizens of the risks of travel to eastern Ukraine due to ongoing violent clashes between Russia-backed separatists and Ukrainian forces in the eastern regions of Donetsk and Luhansk. In addition, Russian military forces continue to occupy the Crimean Peninsula and are present on the eastern border of Ukraine.This supersedes the Travel Warning for Ukraine dated August 1 to provide updated information on the security situation in southern and eastern Ukraine. The Department of State warns U.S. citizens to defer all travel to the eastern regions of Donetsk and Luhansk. Russia-backed separatists continue to control areas in the Donetsk and Luhansk Oblasts. These groups have established illegal checkpoints and have threatened, detained, or kidnapped individuals, including U.S. citizens, for hours or days. The Ukrainian armed forces have launched an operation to reclaim these areas. Violent clashes between the Russia-backed separatists and Ukrainian forces have escalated over the past month and have resulted in hundreds of injuries and deaths. Some of these clashes have included the use of armored vehicles, aircraft, and other military weapons including surface to air missiles, the use of which was responsible for the downing of Malaysia Airlines Flight 17 on July 17. Widespread disorder and looting has been confirmed in areas controlled by Russia-backed separatists in Donetsk and Luhansk Oblasts. These Russian-supported groups have taken on a more strident anti-American tone, especially in eastern Ukraine and Crimea. U.S. citizens who choose to remain in conflict areas should maintain a low profile and avoid large crowds and gatherings. The situation in Ukraine is unpredictable and could change quickly. U.S. citizens throughout Ukraine should avoid large crowds and be prepared to remain indoors and shelter in place for extended periods of time should clashes occur in their vicinity. Peace Corps Volunteers departed Ukraine on February 25, and remain out of the country at this time. U.S. Embassy Kyiv's Consular Section is open for all public services; however, in light of the ongoing unrest, the Embassy has severely restricted the travel of U.S. Government personnel to areas in eastern Ukraine and the Crimean Peninsula, and occasionally limits travel to other adjacent regions. As a result, the Embassy's ability to respond to emergencies involving U.S. citizens in eastern Ukraine and Ukraine's Crimean region is extremely limited. U.S. citizens living or traveling in Ukraine are strongly encouraged to enroll in the Department of State's Smart Traveler Enrollment Program (STEP) to receive the latest travel updates and to obtain updated information on security within Ukraine. By enrolling, U.S. citizens make it easier for the Embassy to contact them in case of emergency. The Department of State alerts U.S. citizens to screening procedures, travel restrictions, and reduced aviation transportation options in response to the outbreak of Ebola Virus Disease in Guinea, Liberia, Nigeria, and Sierra Leone. Due to an outbreak of Ebola Virus Disease (EVD) in the West African nations of Liberia, Guinea, and Sierra Leone, the Centers for Disease Control and Prevention (CDC) issued Level 3 Travel Warnings for those three countries advising against non-essential travel and provided guidance to reduce the potential for spread of EVD. The CDC also issued a Level 2 Travel Alert for Nigeria to notify travelers of the Ebola outbreak in that country. The Bureau of Consular Affairs’ website prominently features an Ebola Fact Sheet and links to the CDC Health Travel Warnings, Travel Alert, and general guidance about Ebola. 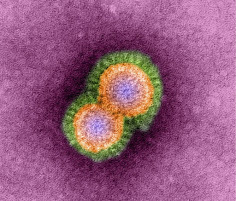 The World Health Organization (WHO) and CDC have also published and provided interim guidance to public health authorities, airlines, and other partners in West Africa for evaluating risk of exposure of persons coming from countries affected by EVD. Measures can include screening, medical evaluation, movement restrictions up to 21 days, and infection control precautions. Travelers who exhibit symptoms indicative of possible Ebola infection may be prevented from boarding and restricted from traveling for the 21-day period. Please note neither the Department of State’s Bureau of Consular Affairs nor the U.S. Embassy have authority over quarantine issues and cannot prevent a U.S. citizen from being quarantined should local health authorities require it. For questions about quarantine, please visit the CDC website that addresses quarantine and isolation issues. The cost for a medical evacuation is very expensive. We encourage U.S. citizens travelling to Ebola-affected countries to purchase travel insurance that includes medical evacuation for Ebola Virus Disease (EVD). Policy holders should confirm the availability of medical care and evacuation services at their travel destinations prior to travel. Some local, regional, and international air carriers have curtailed or temporarily suspended service to or from Ebola-affected countries. U.S. citizens planning travel to or from these countries, in accordance with the CDC Health Travel Warnings and Health Travel Alert, should contact their airline to verify seat availability, confirm departure schedules, inquire about screening procedures, and be aware of other airline options. The Department is aware that some countries have put in place procedures relating to the travel of individuals from the affected countries, including complete travel bans. Changes to existing procedures may occur with little or no notice. 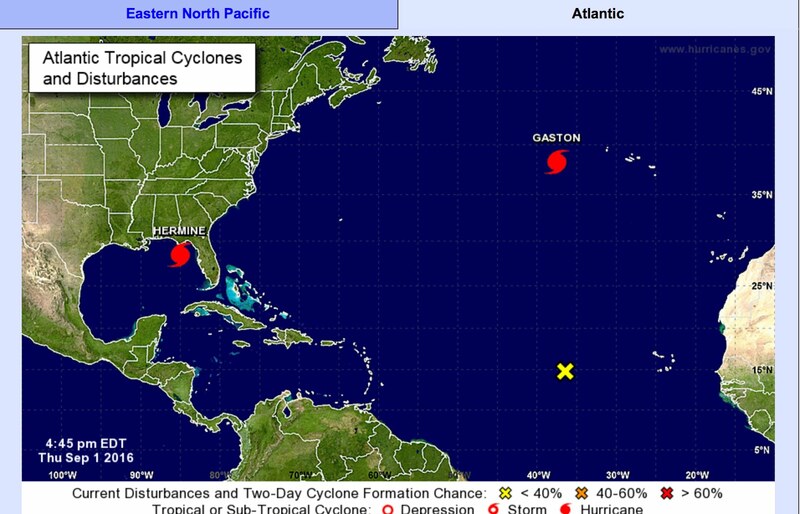 Please consult your airline or the embassy of your destination country for additional information. This Travel Alert will expire on February 27, 2015. Mr. President, representatives on this Council, this is our 24th session to try to rein in Russia’s aggressive acts in Ukraine. Every single one of those sessions has sent a straight-forward, unified message: Russia, stop this conflict. Russia is not listening. In the last 48 hours, Russia’s actions have spoken volumes. On August 26 – just this Tuesday – after meeting with Ukrainian President Poroshenko in Minsk, Belarus, President Putin spoke of the need to quote “end bloodshed as soon as possible.” End quote. 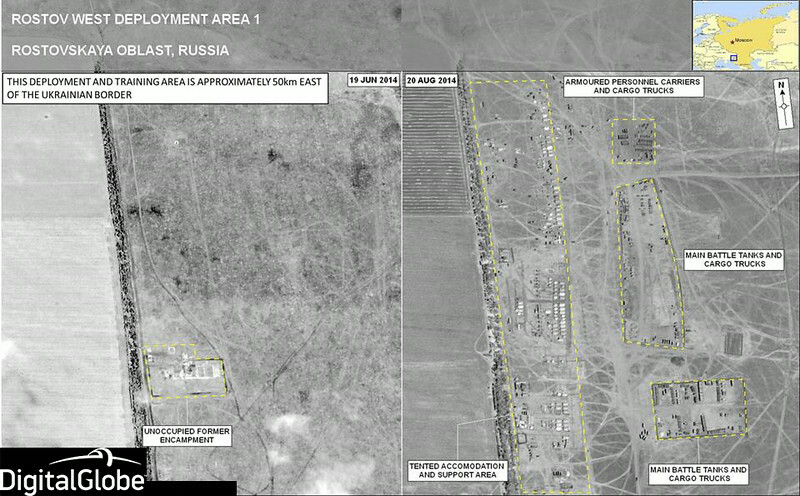 Yet the same day, satellite imagery shows Russian combat units – combat units – southeast of Donetsk, in eastern Ukraine. That same day in Luhansk, Ukraine detained regular Russian Army personnel from the 9th brigade. In response, Russia claimed the soldiers had wandered into Ukrainian territory “by mistake.” This, supposedly, in a time of conflict along one of the most carefully watched borders in the world. The day after those talks, Russia fired Grad rockets from inside Russia at Ukrainian positions in Novoazovsk, and then attacked with two columns of Russian armored vehicles and tanks. Russian armored vehicles and Uragan multiple rocket launchers are positioned on the outskirts of that town as we speak. Russia’s force along the border is the largest it has been since it began redeploying forces there in late May, and includes significant numbers of combat aircraft and helicopters. Russian unmanned aircraft routinely cross into Ukrainian airspace. Other Russian deployments into Ukrainian territory include advanced artillery and air defense systems not found in the Ukrainian inventory. These artillery systems have shelled Ukrainian positions outside Luhansk City in conjunction with the recent separatist counteroffensive. One of the separatist leaders that Russia has armed and backed said openly that three or four thousand Russian soldiers have joined their cause. He was quick to clarify that these soldiers were on vacation. But a Russian soldier who chooses to fight in Ukraine on his summer break is still a Russian soldier. And the armored Russian military vehicle he drives there is not his personal car. Meanwhile, in Russia, family members of Russian soldiers are holding funerals for their loved ones who have been killed in the fighting in Ukraine. They’re demanding answers for how they were killed. Journalists who try to cover these funerals are harassed and threatened by armed men. Yet, still, according to the Russian government, the soldiers were never there. They were never in Crimea either, until Russia announced that those soldiers who were never there had annexed Crimea. The last 48 hours fit into a well-established pattern for Russia. Each step has paved the way for the one that followed. And yet in spite of all of these outrageous actions, Ukraine has repeatedly sought a political solution to this crisis. It has repeatedly sought a path to de-escalation. Despite this pattern, President Poroshenko showed up in Minsk to meet with President Putin. In contrast, President Putin was still unwilling to acknowledge the most basic facts we all know: that Russia has armed, equipped, and now joined illegal separatists fighting in Ukraine. Serious negotiations are needed, urgently needed. But Russia has to stop lying and has to stop fueling this conflict. 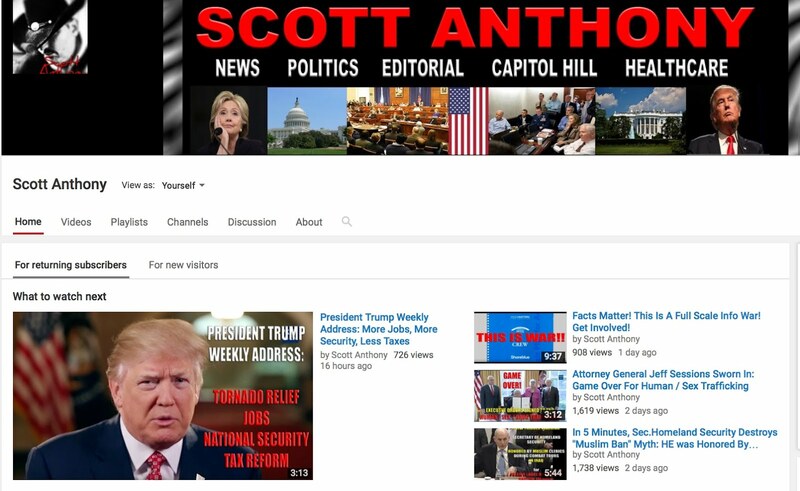 The mask is coming off. In these acts – these recent acts – we see Russia’s actions for what they are: a deliberate effort to support, and now fight alongside, illegal separatists in another sovereign country. Now, Russia has claimed that Ukraine is not interested in a ceasefire, but let’s be clear: we have every interest in a ceasefire, as do the Ukrainians, as long as it is a real one. But Russian separatists not only have no interest in observing a ceasefire, but they cynically use the time to rearm and wait for additional soldiers and supplies to flow across the border from Russia. In the face of these deeply alarming actions, the most important question for us now is not what we should say to Russia. The most important question is what we should do to make Russia listen. The United States has, throughout this crisis, and in close coordination with our European partners, the EU and the G7, exerted targeted, effective pressure so that this message is heard, so that Russia begins to de-escalate, rather than escalate, so that the reasonable peace plan put forward by President Poroshenko is adopted and implemented. And in the face of Russia’s continued aggression and blatant disregard for the UN Charter, the Helsinki Final Act, we will continue to work closely with our G7 and European partners to ratchet up the consequences on Russia. Now, I understand that there are real costs felt by citizens of countries when their governments take these actions. It has costs for businesses that trade with Russia and sell to Russian markets, from small-scale farmers to big factories. Those costs are considerable, and nobody should take them lightly. But let’s be clear: if unchecked, the damage that Russia’s blatant disregard for the international order poses is much, much greater. These rules and principles that have taken generations to build, with unparalleled investment – countless lives have been lost to establish and defend these principles. And every single one of us has a stake in defending them. A threat to the order – the international order – is a threat to all of our peace and security. These are the rules that Russia is flouting when it illegally seizes territory and arms, equips, and fights alongside illegal groups in neighboring countries. Ukraine is one of roughly a dozen countries that share a border with Russia. Let me close with a couple questions: How can we tell those countries that border Russia that their peace and sovereignty is guaranteed if we do not make our message heard on Ukraine? Why should they believe it will be different if tomorrow, President Putin decides to start supporting armed separatists and allowing soldiers “on vacation” to fight in their countries? And, just as important, what message are we sending to other countries with similarly alarming ambitions around the world, when we let Russia violate these rules without sufficient consequences? In the face of this threat, the cost of inaction is unacceptable. BARNES AIR NATIONAL GUARD BASE, Mass., Aug. 29, 2014 – Massachusetts National Guard officials today identified the pilot of an F-15C Eagle jet that crashed in Virginia as Air Force Lt. Col. Morris "Moose" Fontenot Jr. The veteran aviator was killed Aug. 27 when his aircraft crashed in remote, mountainous terrain near Deerfield Valley. “We all continue to keep the Fontenot family in our thoughts and prayers during this very difficult time,” said Col. James Keefe, commander of the 104th Fighter Wing based here. Fontenot served with the 104th Fighter Wing as the full-time Wing Inspector General, responsible for the implementation of the Air Force Inspection System and as an F-15 instructor pilot with more than 2,300 flight hours. A 1996 Air Force Academy graduate, he was additionally a Weapons School Graduate with more than 17 years of F-15 flying experience. He served as a squadron commander at multiple locations. Following active duty assignments in Washington D.C., Japan, Idaho, Florida, Alaska and numerous deployments to the Middle East, Fontenot joined the Massachusetts Air National Guard in February 2014. He was a decorated combat veteran, earning the Meritorious Service Medal, Air Medal, Aerial Achievement Medal, Air Force Commendation Medal, Air Force Achievement Medal, and Combat Readiness Medal, among others. An official safety investigation board is being convened and the investigation into the crash is ongoing. A massive search ensued following the Aug. 27 crash of the jet in dense forest. The search involved personnel from the National Guard, Virginia State Police and civilian searchers, some with dogs and others on horseback. At approximately 9:05 a.m. Aug. 27, Washington Center Air Traffic Control in Washington, D.C., lost radio contact with the aircraft stationed at the 104th Fighter Wing, and at approximately 9:30 a.m. the wing learned that the aircraft had crashed in a remote site near Deerfield Valley, Virginia. The single seat F-15C aircraft was en route to Naval Air Station New Orleans to receive a radar system upgrade. The flight was not related to the 104th Fighter Wing’s homeland defense mission, and there were no munitions on the aircraft during the flight, a National Guard news release said. Fontenot was flying a solo mission when he reported an in-flight emergency prior to the loss of radio contact with Washington Center. WASHINGTON, Aug. 29, 2014 – Russia continues to build up along its border with Ukraine and has moved sophisticated weapons systems into the country, the Pentagon press secretary said here today. Navy Rear Adm. John Kirby told reporters that Russian military forces are part of those movements. Russian forces are, “facilitating the movement and then helping the separatists use the systems, if not using it themselves in support of separatists,” he said. 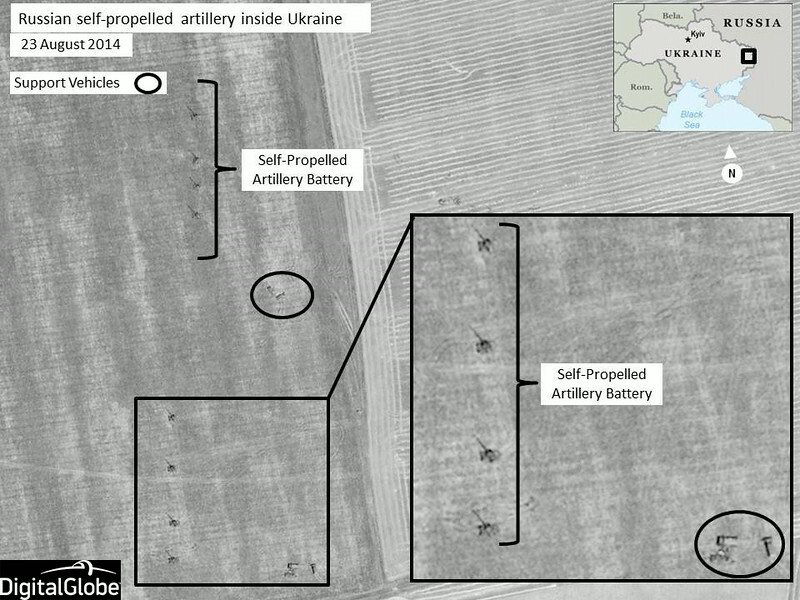 NATO has released surveillance photos showing these assets inside Ukraine. Kirby tied the Russian movements to the success that Ukraine has had against Russian-backed separatists in the country. “We believe that that has helped foster Moscow’s intention to intensify these efforts,” he said. Kirby called Russian actions an “intensification” of the behaviors the Kremlin has exhibited for months. President Barack Obama addressed the issue yesterday during a White House news conference. Russia has deliberately and repeatedly violated the sovereignty and territorial integrity of Ukraine, the president said. He called on nations of the world to impose new sanctions against Russia. “As a result of the actions Russia has already taken and the major sanctions we’ve imposed with our European and international partners, Russia is already more isolated than at any time since the end of the Cold War,” the president said. Obama said he would reaffirm U.S. commitment to the defense of NATO allies and said he would speak with fellow NATO leaders at the summit in the United Kingdom next week. “We’ll focus on the additional steps we can take to ensure the alliance remains prepared for any challenge,” he said. Ukraine is not a NATO member, but the United States does “stand shoulder-to-shoulder with them,” the president said. WASHINGTON, Aug. 29, 2014 – Military officials here and at U.S. Central Command are working to present President Barack Obama with options to contain the Islamic State of Iraq and the Levant in Syria, Pentagon Press Secretary Navy Rear Adm. John Kirby said here today. Kirby told reporters that officials are taking under consideration the changing situation with the terror group. During a White House press conference yesterday, President Obama said he had directed DoD to present options to him. 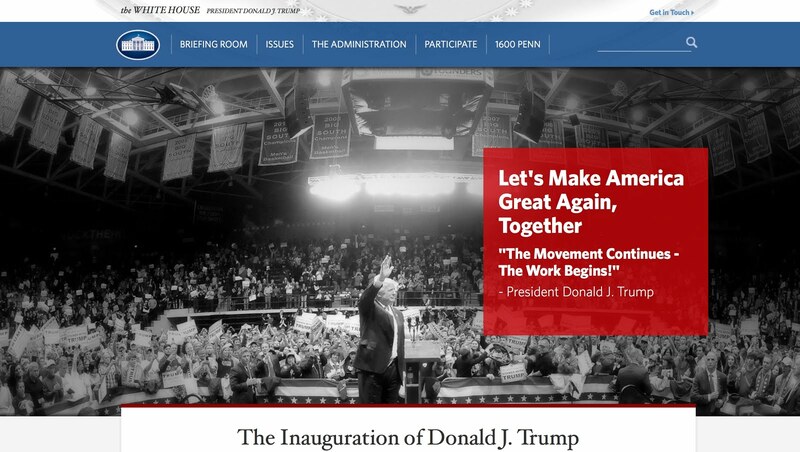 Still, the department is not at the point where plans are mature enough to have the discussion with the commander-in-chief, Kirby said. A second point is that all those involved, including the president, Defense Secretary Chuck Hagel and Army Gen. Martin E. Dempsey, the chairman of the Joint Chiefs of Staff, have repeatedly said that options in Syria are not limited to the military. Containing and eliminating the terror group will take all elements of national power, he said. “So while we certainly, for our part, have to work on what those options could look like, there are other parts of our government that are working, as well, on options that they might need to pursue in the future going forward,” the admiral said. In the meantime, Kirby said, operations against ISIL will continue. The United States has been providing humanitarian aid to Iraqis victimized by ISIL’s brutal tactics. U.S. aircraft have also flown a number of strikes against the terror group in and around Irbil and around the Mosul Dam area. “We're up almost to 110 air strikes total since they began,” Kirby said. Officials said that on a tactical level inside Iraq, the strikes are having an effect on ISIL’s ability to operate. “We’re being disruptive to their operations, to their command and control, to their ability to move around,” Kirby said. Delivering humanitarian assistance in Iraq and building capabilities of Iraqi security forces are also ways to impact and degrade ISIL. DoD has asked for $500 million for a train and equip program for a moderate Syrian opposition. Officials confirmed today the pilot was fatally injured in the Aug. 27 crash of an F-15C Eagle in the remote mountains near Deerfield Valley, Va. The pilot's name is being withheld pending notification of family members and will be released when appropriate. "Our thoughts and prayers are with the family and we are doing all we can to support them during this very difficult time," said Col. James Keefe, Commander, 104th Fighter Wing. "We ask that everyone respect the privacy of the family and allow them the time they need to grieve," added Keefe. A press conference with the 104th Fighter Wing Commander, Col. James Keefe, is scheduled for approximately 10:00 p.m. at the entrance to the 104th Fighter Wing. An additional press conference with Brig. Gen. Robert Brooks, Commander of the Massachusetts Air National Guard, is schedule on-site in Deerfield, Va. for approximately 10:15 p.m.
At approximately 9:05 a.m. Wednesday, Washington Center Air Traffic Control in Washington, D.C. lost radio contact with the F-15C aircraft stationed at the 104th Fighter Wing, Mass., and at approximately 9:30 a.m. the 104th Fighter Wing learned that the aircraft had crashed in a remote site near Deerfield Valley, Va. The single seat F-15C aircraft was en route to Naval Air Station New Orleans to receive a radar system upgrade. The flight was not related to the 104th Fighter Wing's homeland defense mission, and there were no munitions on the aircraft during this flight. The pilot was flying a solo mission when he reported an in-flight emergency prior to the loss of radio contact with Washington Center. WASHINGTON, D.C. – August 27, 2014: The U.S. Agency for International Development (USAID) is providing an additional $5 million to help combat the Ebola outbreak in West Africa. The announcement brings USAID’s commitment for the Ebola response to nearly $19.6 million since the outbreak was first reported in March 2014. Jeremy Konyndyk, Director of USAID’s Office of U.S. Foreign Disaster Assistance, announced the additional funding in Monrovia, Liberia, during his three-day visit with Dr. Tom Frieden, Director of the U.S. Centers for Disease Control and Prevention (CDC). Konyndyk and Frieden arrived in Monrovia on August 24 to assess the impact of the Ebola outbreak first-hand, review response activities, and discuss disease prevention and treatment strategies with Liberian officials. The additional funding will be used to provide health equipment and emergency supplies, train and support health care workers on infection control and case management, support public outreach campaigns, and help build the capacity of local health care and emergency response systems. The announcement comes just days after USAID airlifted more than 16 tons of medical supplies and emergency equipment to Liberia, including 10,000 sets of personal protective equipment (PPE), water treatment systems, water tanks capable of storing 10,000 liters each, and 100 rolls of plastic sheeting, which can be used in the construction of Ebola treatment units. USAID deployed a multi-agency Disaster Assistance Response Team (DART) on August 5 to coordinate the U.S. Government’s Ebola response efforts in West Africa. The DART has more than 25 members operating in Liberia, Guinea, and Sierra Leone. BEIJING — China said Thursday it will continue responding to U.S. military surveillance flights off its coast, rejecting American accusations that one of Beijing's fighter jets acted recklessly in intercepting a U.S. Navy plane last week. Defense Ministry spokesman Yang Yujun said China's military would closely monitor U.S. flights and reiterated calls for the U.S. to scale back or end such missions altogether. "According to different situations we will adopt different measures to make sure we safeguard our air and sea security of the country," Yang said at a monthly news briefing. China has long complained about U.S. surveillance flights that just skim the edge of China's territorial airspace. However, Yang said such flights this year have become more frequent, are covering a wider area and are coming even closer to the Chinese coast. U.S. sea and air surveillance missions occur most frequently during Chinese military exercises or weapons tests, raising the risk of accidents and misunderstandings, Yang said. That was a likely reference to an incident last December in which China accused a U.S. Navy cruiser, the USS Cowpens, of having veered too close to China's sole aircraft carrier in the South China Sea during sea drills. That nearly led to a collision with a Chinese navy ship in the most serious sea confrontation between the two nations in years. The latest incident also revived memories of the 2001 collision between a Chinese jet and a U.S. Navy surveillance aircraft off China's Hainan Island, killing the Chinese pilot and forcing the Navy plane to make an emergency landing on the island. Yang, however, wouldn't say what distance China considers acceptable, saying only that the U.S. should scale back or end such flights entirely if it wants to avoid potential accidents and build mutual trust. The Pentagon said that in the Aug. 19 encounter, a Chinese jet made several close passes by the Navy P-8 Poseidon plane, coming within 30 feet (9 meters) of it at one point. It said that included the Chinese jet doing a "barrel roll" maneuver over the top of the Poseidon — a modified Boeing 737 — and passing across the nose of the Navy plane apparently to show that it was armed. The incident took place about 135 miles (220 kilometers) from Hainan, which is home to naval airfields and a highly sensitive submarine base. Yang rejected U.S. accusations that the Chinese pilot acted in a dangerous and unprofessional manner, saying it was the U.S. that seemed to have little regard for the safety of its personnel. "China is a developing country. Our aircraft are very precious. The lives of our pilots are even more precious," Yang said. "Compared to countries that ask their pilots to fly down on other countries' door steps, we cherish more the safety of our personnel and equipment." Mons, BELGIUM – NATO released new satellite images on Thursday, 28 August 2014, that show Russian combat forces engaged in military operations inside the sovereign territory of Ukraine. The images, captured in late August, depict Russian self-propelled artillery units moving in a convoy through the Ukrainian countryside and then preparing for action by establishing firing positions in the area of Krasnodon, Ukraine. Dutch Brigadier General Nico Tak, director of the Comprehensive Crisis and Operations Management Centre (CCOMC), Allied Command Operations said the images confirmed what NATO and its Allies had been seeing for weeks from other sources. "Over the past two weeks we have noted a significant escalation in both the level and sophistication of Russia's military interference in Ukraine," said Brigadier General Tak. "The satellite images released today provide additional evidence that Russian combat soldiers, equipped with sophisticated heavy weaponry, are operating inside Ukraine's sovereign territory," he said. These latest images provide concrete examples of Russian activity inside Ukraine, but are only the tip of the iceberg in terms of the overall scope of Russian troop and weapons movements. Russian military units moving in a convoy formation with self-propelled artillery in the area of Krasnodon, Ukraine, well inside territory controlled by Russian separatists. 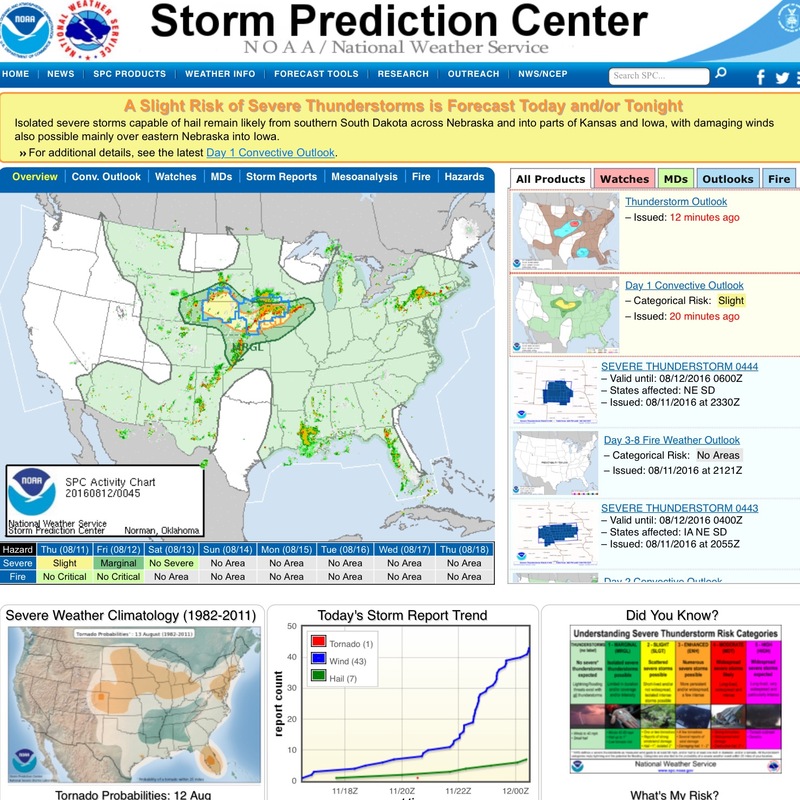 The image was captured on 21 August 2014. There is confidence the equipment is Russian, since Ukrainian units have not yet penetrated this far into separatist controlled territory. 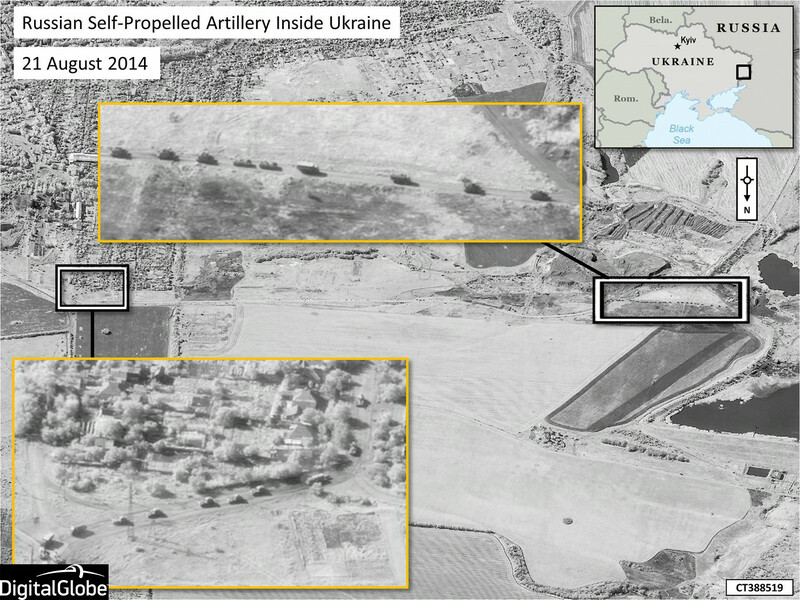 Russian self-propelled artillery units set up in firing positions near Krasnodon, Ukraine. They are supported by logistical vehicles which are likely carrying extra ammunition and supplies. This configuration is exactly how trained military professionals would arrange their assets on the ground, indicating that these are not unskilled amateurs, but Russian soldiers. Russian artillery systems like these have recently shelled Ukrainian positions outside the city of Luhansk in conjunction with a separatist counteroffensive to attempt to break the Ukrainian siege of the city. Military deployment site on the Russian side of the border, near Rostov-on-Don. This location is approximately 31 miles or 50 kilometres from the Dovzhansky, Ukraine border crossing. This photo depicts what are probably six Russian 153mm 2S19 self-propelled guns located in Russia near Kuybyshevo. This site is situated 4 miles, or 6.5 kilometres, south of the Ukraine border, near the village of Chervonyi Zhovten. The guns are pointed north, directly towards Ukrainian territory (see North indicator on image). 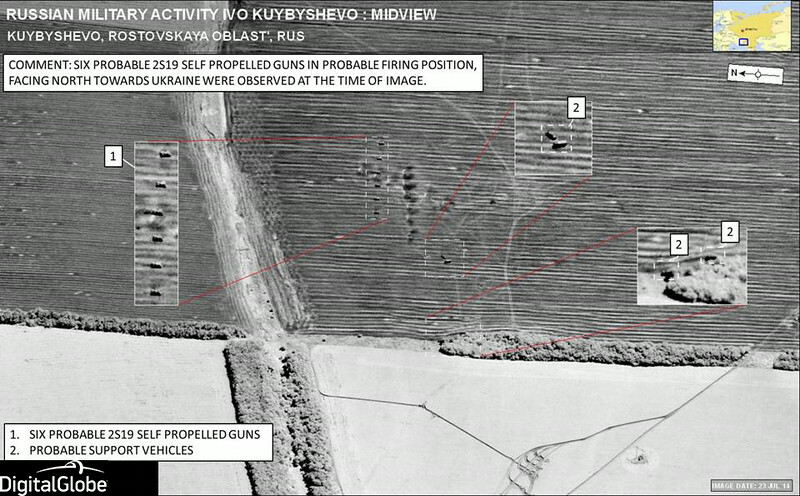 See image 5 for an overview of where these guns are situated in relation to Ukrainian territory. Wider overview including the position of the self-propelled guns from image 4. Note the North indicator on this image, and remember that the guns are orientated in this location. It is clear that from this location, it would be impossible NOT to fire into Ukrainian territory. This is clearly NOT an exercise; these guns are being used to support separatist forces operating in the territory of Ukraine. "We have also detected large quantities of advanced weapons, including air defence systems, artillery, tanks, and armoured personnel carriers being transferred to separatist forces in Eastern Ukraine," said Brigadier General Tak. "The presence of these weapons along with substantial numbers of Russian combat troops inside Ukraine make the situation increasingly grave," he said. 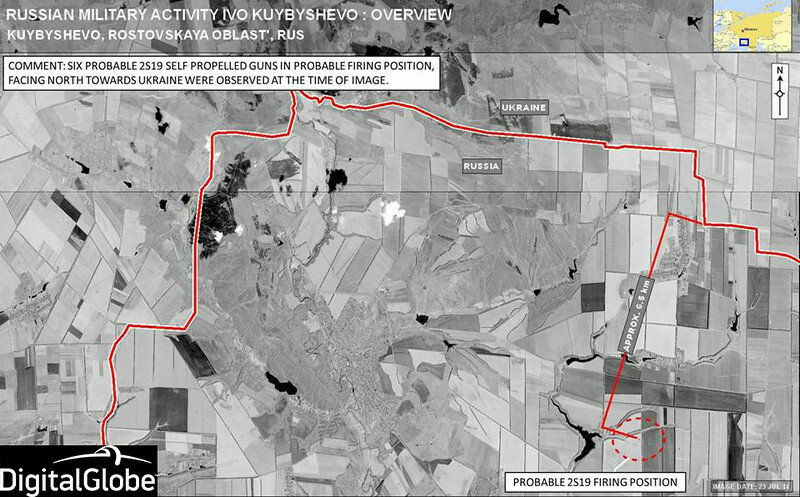 Also released were images showing substantial activity inside Russia in areas adjacent to the border with Ukraine. NATO believes this activity is being conducted in direct support to forces operating inside Ukraine, and is part of a highly coordinated and destabilising strategy. "Russia is reinforcing and resupplying separatist forces in a blatant attempt to change the momentum of the fighting, which is currently favouring the Ukrainian military," Brigadier General Tak said. "Russia's ultimate aim is to alleviate pressure on separatist fighters in order to prolong this conflict indefinitely, which would result in further tragedy for the people of Eastern Ukraine," he added. WASHINGTON, Aug. 28, 2014 – U.S. military forces continued to attack ISIL terrorists in support of Iraqi security force operations, using fighter aircraft to conduct five airstrikes in the vicinity of the Mosul Dam. The strikes destroyed an ISIL Humvee, a tank, four armed vehicles, an ISIL construction vehicle and severely damaged an ISIL checkpoint. All aircraft exited the strike areas safely. The strikes were conducted under authority to support Iraqi security force and Kurdish defense force operations, as well as to protect critical infrastructure, U.S. personnel and facilities, and support humanitarian efforts. Since Aug. 8, U.S. Central Command has conducted a total of 106 airstrikes across Iraq. WASHINGTON, Aug. 28, 2014 – President Barack Obama has directed Defense Secretary Chuck Hagel and Army Gen. Martin E. Dempsey, the chairman of the Joint Chiefs of Staff, to present a range of options aimed at the Islamic State of Iraq and the Levant. The United States has struck the terror group in Iraq. Any effort taken against the group in its sanctuary in Syria must be part of a broader regional and international effort, the president said. “Rooting out a cancer like ISIL will not be quick or easy, but I'm confident that we can, and we will, working closely with our allies and our partners,” Obama said. The president said the options he’s asking for are aimed primarily at thwarting ISIL’s designs in Iraq. “My priority at this point is to make sure that the gains that ISIL made in Iraq are rolled back and that Iraq has the opportunity to govern itself effectively and secure itself,” he said. “We're going to have to build a regional strategy” to degrade ISIL over the long term, Obama said. All aspects of national and international power must be in play, the president said. Diplomatic, political and economic power will be just as important as military actions, he said. The limited airstrikes against ISIL in Iraq have had an effect, Obama said. BARNES AIR NATIONAL GUARD BASE, Mass., Aug. 28, 2014 – The search in Virginia for a missing 104th Fighter Wing pilot expanded today with Air Force resources. An F-15C Eagle aircraft assigned to the Massachusetts Air National Guard’s 104th Fighter Wing here crashed in Deerfield, Virginia, at about 9:05 a.m. yesterday, about five minutes after radio contact with the pilot was lost. Since yesterday morning, a search-and-rescue operation in the Washington National Forest area near Deerfield Valley in Virginia has been ongoing. The search efforts now include a specially equipped HC-130 aircraft assigned to Moody Air Force Base in Georgia that has specialized equipment designed for low-light/night-time search and rescue operations. The HC-130 has been conducting air operations since 3 a.m.
Additionally, as many as seven helicopters have been conducting aerial night searches. Throughout yesterday, at least 100 state police, sheriff’s deputies and fire-and-rescue personnel have been on scene. The ground search slowed overnight due to the dangerous terrain around the crash site. Approximately 10 search-and-rescue teams were on the ground searching along logging roads, fire trails and forest roads. The terrain is too treacherous for off-road ground searches in the dark, according to Corinne Geller, a spokeswoman for Virginia State Police. The search for the missing pilot and the investigation into the crash are ongoing. Virginia Army National Guard aviators assisted with aerial search-and-rescue efforts with Lakota and Black Hawk helicopters, soldiers and airmen from the Fort Pickett, Virginia-based 34th Civil Support Team provided communications and incident management assistance and additional Guard personnel coordinated the overall aviation operation. The pilot flying the F-15C made a report of an inflight emergency prior to radio contact being lost. The F-15C aircraft was en route to receive a system upgrade and there were no munitions on the aircraft during this cross-country trip. 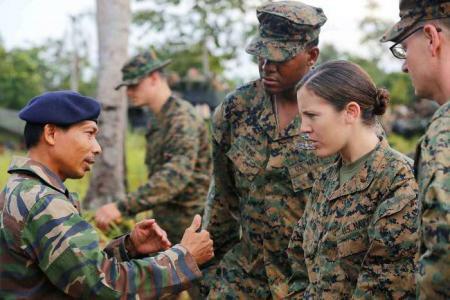 A medical team with Combat Logistics Battalion 11, 11th Marine Expeditionary Unit, listens to a member of the Malaysian Armed Forces during Malaysia-United States Amphibious Exercise 2014. MALUS AMPHEX 14 is designed to allow the 11th MEU to work with the Malaysian Armed Forces to hone their amphibious capabilities by conducting amphibious rehearsals with ship-to-shore connectors and utilizing the rapid response planning processes. Members of the United States and Malaysian armed forces came together to officially open Malaysia – United States Amphibious Exercise 2014 during an opening dinner at Kg Tanduo, Malaysia, Aug. 26. Approximately 500 Marines and sailors from the 11th Marine Expeditionary Unit will be partnered with members of the 7th and 22nd Royal Malay Regiments. A small number of planners from Amphibious Squadron Five and the Makin Island Amphibious Ready group will also be partnered with planners from the Malaysian Armed Forces. Col. Matthew Trollinger, the 11th MEU’s commanding officer, urged participants to use the exercise as an opportunity to learn from each other and to work together. “The U.S. and Malaysia have shared a longstanding military relationship and we are grateful to build upon that tradition over the next week,” said Trollinger. Partnered training with the Malaysian Armed Forces includes shipboard familiarization, medical and dental capabilities, weapons familiarization, amphibious rehearsals with ship-to-shore connectors, live-fire ranges, rapid response planning process, execution of an amphibious assault and landing, and reconstitution. The U.S. military and Malaysian Armed Forces have partnered in counter-terrorism operations since 1985 and have participated in numerous exercises over the years. MALUS AMPHEX 14 is a realistic and challenging exercise that brings service members closer and improves both nations’ ability to work bilaterally, which better prepares both nations to provide regional and global security.